The basic unit required for construction is sand. In older days, natural sand was used for construction purposes and they were extracted from river beds. Because of the higher presence of slit & clay and the requirement of cement is more in river sand. And that’s how manufacturers started looking for an alternative. So they started producing sand from hard granites by crushing which led to the birth of M Sand or Manufactured Sand. They have more durability and quality is also assured. M Sand or Manufactured Sand is extracted from granites. The size of M Sand is always less than 4.75 mm. Transportation cost of M Sand is lesser and you can manufacture it near to your construction sites. They are also easily available because they are crushed from granites. Crushing: Hard granite stones are crushed in Vertical Shaft Impact crusher where cubical and angular fine aggregate particles are manufactured for M Sand in Bangalore. 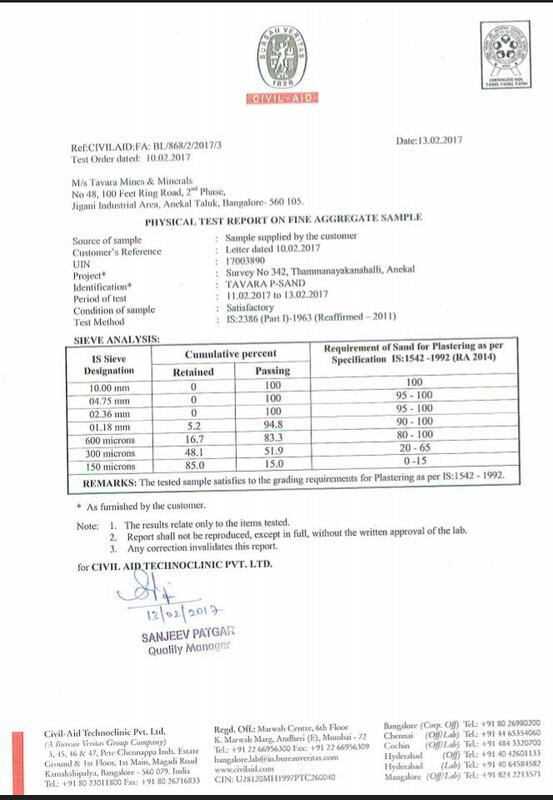 Screening: The screening process of M Sand in Mysore assists in thoroughly grading of the material to make it similar to river sand. Washing: Washing removes all micro-fine particles. This M Sand is vastly different from that of crusher dust. Additionally, in the washing process, both fine aggregates for concrete and plaster Sand can be generated. Higher durability and strength to concrete by mastering the lacks of segregation, bleeding, honeycombing, voids and capillary. Well-graded aggregates are available in required proportions. Cohesion and compressive strength are greater. Concrete/ mortar quality is more beneficial. The chances of slumping are lower. M sand in Bangalore has lesser impurities and it is free from dust because it is manufactured. Lesser Permeability for M Sand in Mysore. Excellent in the strength of Concrete. No Over-sized particles in M sand in Mysore. They can also withstand the worst environmental conditions. They prevent the corrosion of reinforcement steel by reducing moisture ingress,freeze-thaw effect. Construction Defects are less for M Sand in Bangalore. Adulteration test – Less adulteration. Workability test – Higher workable concrete with less water content. Rebound test –Concrete strength is excellent. Slump cone test – Strength of fresh concrete is higher and the chances of slumping are lesser. block work & much more. B) Used as an aggregate: Granule thickness of 8 mm – 13 mm, and 13 mm – 21 mm is suitable only for concreting. ceiling plastering, and much more. A) Used as an aggregate: Granule thickness of 25 mm – 45 mm. Manufactured Sand (M Sand ) is an Eco-friendly material, higher durability, and uniform aggregates are also available. Lesser permeability and cohesion and compressive strength are higher. Water retentivity is also better. Lesser impurities and there is no over-sized particles in M Sand in Bangalore. M Sand in Mysore also has fewer waste materials. That’s how M sand became favorite for people. As a renowned name in M Sand in Bangalore and dealers for plastering, block work, concrete. Tavara Mines and Minerals also ensures the quality of M sand in Bangalore. We also undertake the above-mentioned tests for greater quality. Tavara Sands always prefers M Sand in Mysore over River Sand because they are more durable and workability is also higher. We provide 100% water washed M sand in Mysore. We in Tavara runs periodic tests to test the strength and durability of M Sand produced here. That’s Why M Sand is favored for a strong structure in Tavara Sands.